The anticipated LG Nexus 5 could well be the device that Android fans are waiting for and is expected to be the pinacle of Android smartphones. As we get nearer to the launch date of the LG Nexus 5 more leaked images and data are appearing on the web. The latest leaks now come from a member of the MacRumours site who claims to have a new Nexus 5 in his possession and has gone a step further taking photos and providing commentary on the device. 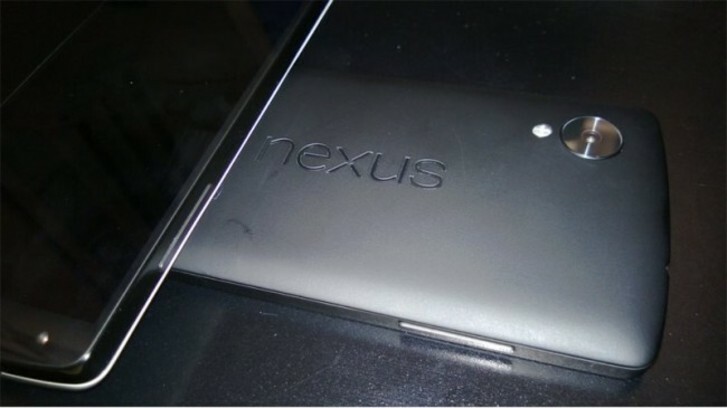 The photo, that you can see above, shows a large camera, Nexus logo and and almost graphite colour back. The poster “Weespeed” states that he thinks the Nexus 5 feels smaller than the LG G2 and feels close to the Nexus 7. He then goes on to say that the display on the Nexus 5 is just “Ok” and doesn’t feel as high in quality as the Galaxy Note 3. What we understand of the Nexus 5 Specification is that we can expect a 5-inch full HD display, 2.3 GHz Qualcomm Snapdragon 800 processor, at least 2GB of RAM, 16GB of storage, 8-megapixel rear-camera, 1.2-megapixel front-camera, 2300mAh battery, wireless charging, LTE and NFC. We know that there is a Google event to be held on the 15th October where they are going to offically announce Android 4.4 Kit Kat so we expect that the LG Nexus 5 will follow close behind that event and will also feature Google’s latest Android OS.